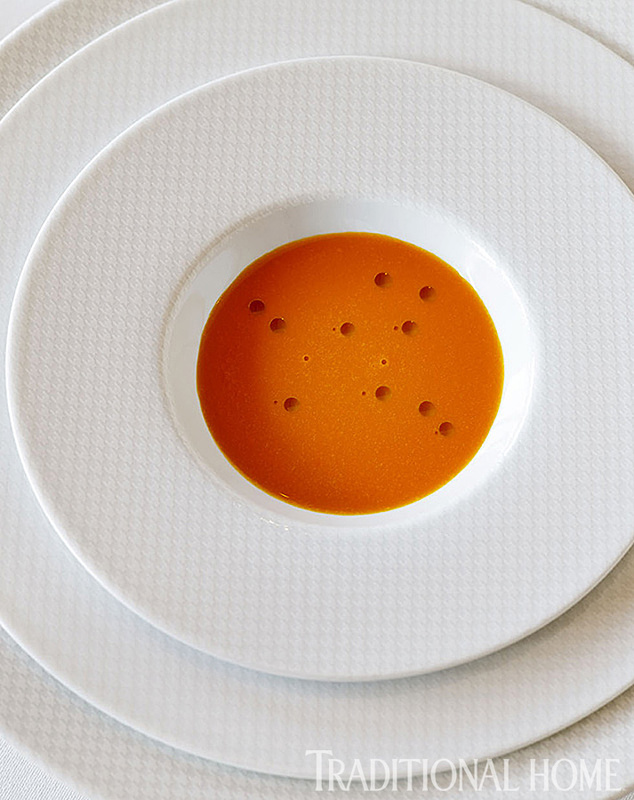 The French Laundry’s philosophy of classic recipes translated for modern days echoes Traditional Home’s credo, “Timeless design for modern living,” so we are proud to share a milestone year with the renowned restaurant. 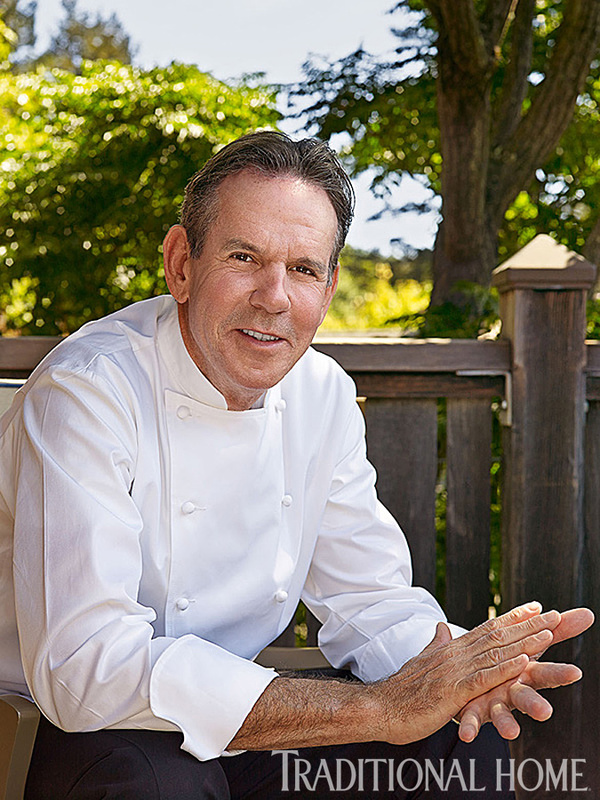 However, Chef Thomas Keller wants to make one thing perfectly clear: The 20th anniversary celebration of his Napa Valley establishment is not about him. It’s about everyone who has walked through its famous blue front door or the copper-clad one at the rear of the restaurant that leads to the kitchen. 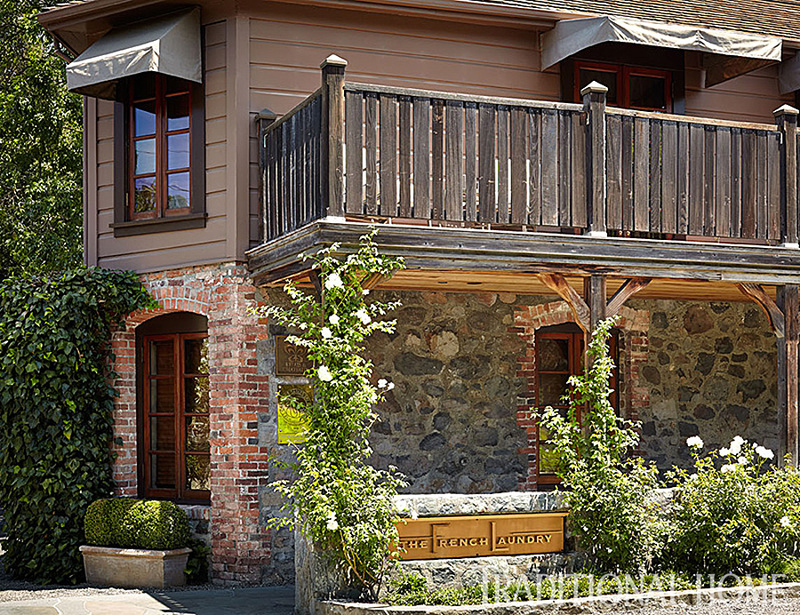 The U.S. Department of the Interior awarded The French Laundry building historical preservation status. To celebrate the anniversary, the Michelin-starred restaurant marked the occasion in July with a week-long series of events, kicked off with a dinner menu from 1994. Salutes throughout the week included an anniversary dinner for the original investors and an “alumni” picnic for 500 guests, including past and present employees. A Thomas Keller-style block party held on the street outside the restaurant hosted 540 friends, family, and neighbors, where treats ranged from truffled macaroni and cheese to caviar served in tiny jam jars. The man who is one of the most famous and influential chefs on the planet is genteel, charming, and articulate, as well as a mentor and a traditionalist. “We want to reach for new standards, we always want to be evolving and search for the next level of quality,” he says. When Keller took over The French Laundry kitchen 20 years ago, he set a benchmark for cuisine and service for contemporary dining. His dinners of impeccable, bite-size tastings and an informed, gracious staff helped establish the restaurant’s reputation, and a generation of chefs followed suit. 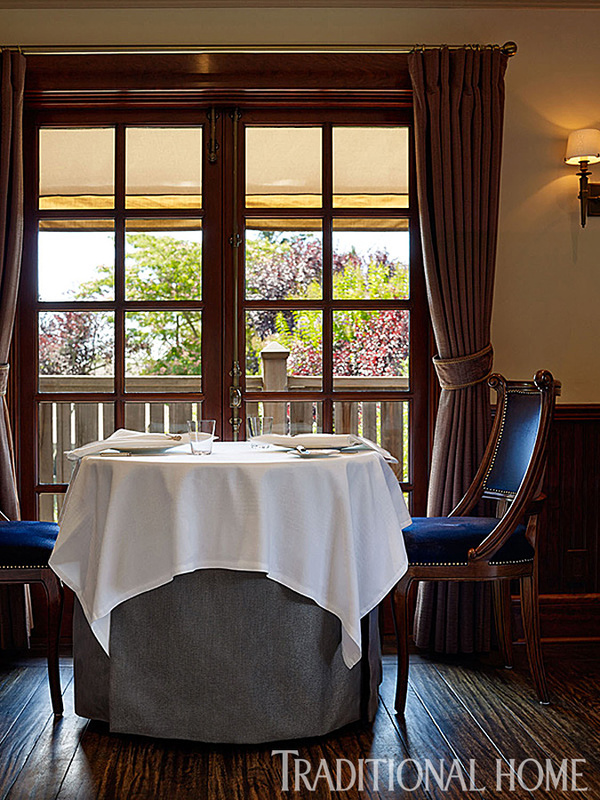 To prepare the restaurant for the future, The French Laundry will soon be launching a renovation. New kitchen space, the wine cellar, and offices will be built or expanded to allow the restaurant to maintain its standards of excellence. Keller will also spearhead the training of the U.S. team for the 2015 Bocuse d’Or, the biennial international competition likened to a culinary Olympics. Nationally renowned chefs along with chefs from The French Laundry will participate in the training. For home cooks, Keller advises: “Take simple tasks and do them over and over. You don’t have to learn 20 different things—learn five or six and do them really well. Augment them with new things every once in a while so you continue to challenge yourself. Order and precision reign in the kitchen. A view of the upstairs dining room. 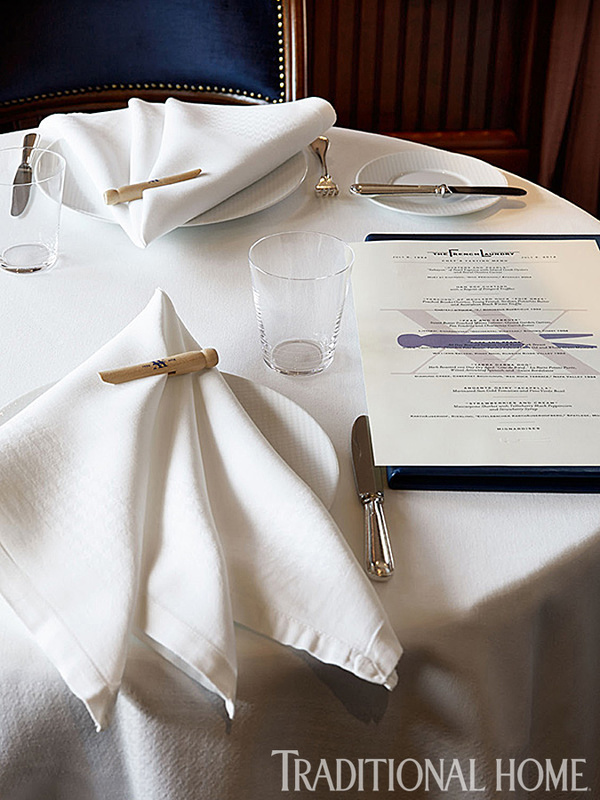 The French Laundry’s iconic clothespin adorns napkins and the anniversary menu. 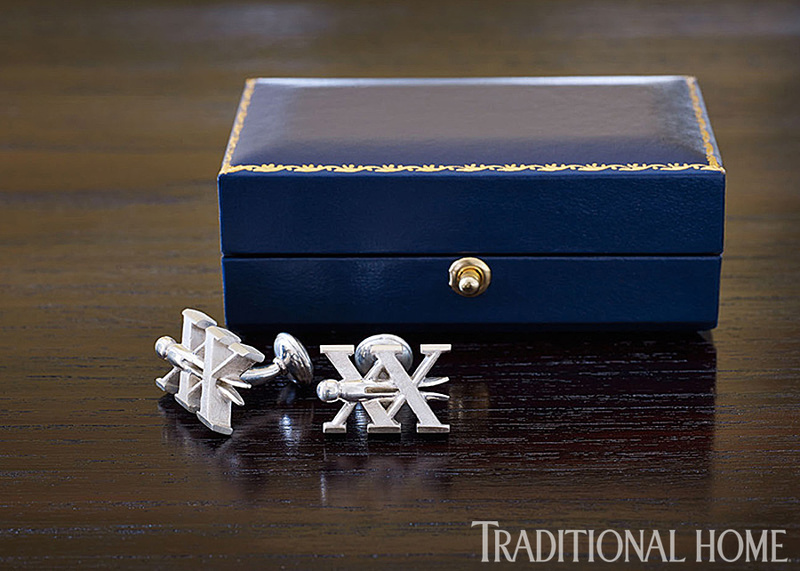 A gift of sterling-silver cufflinks commemorated the restaurant’s 20th anniversary. Carrots from the restaurant’s garden are prepped for dinner. 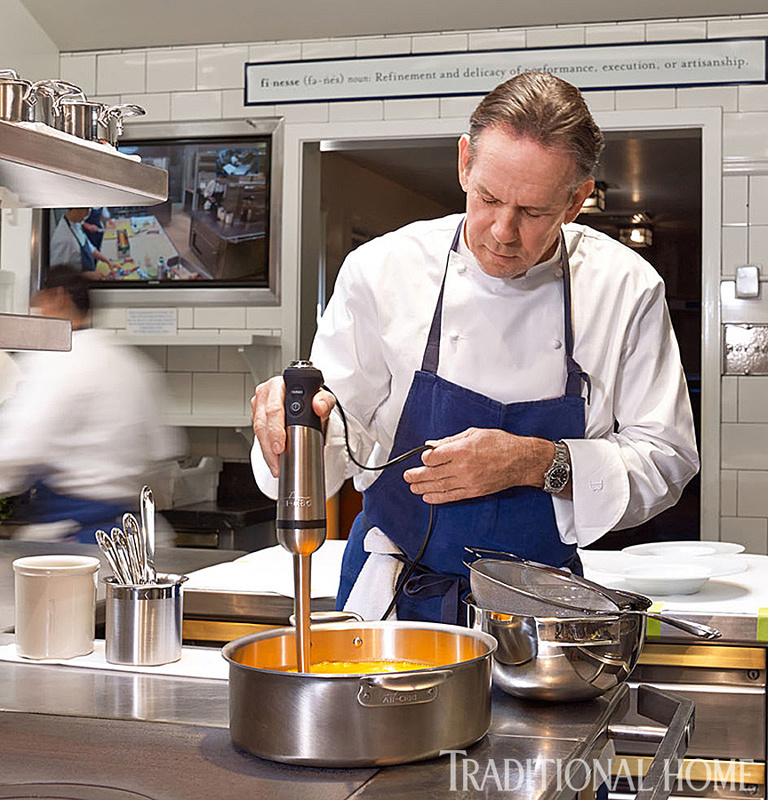 Chef Thomas Keller prepares his Purée of Sweet Carrot Soup in the rondeau from his signature line of All-Clad cookware. 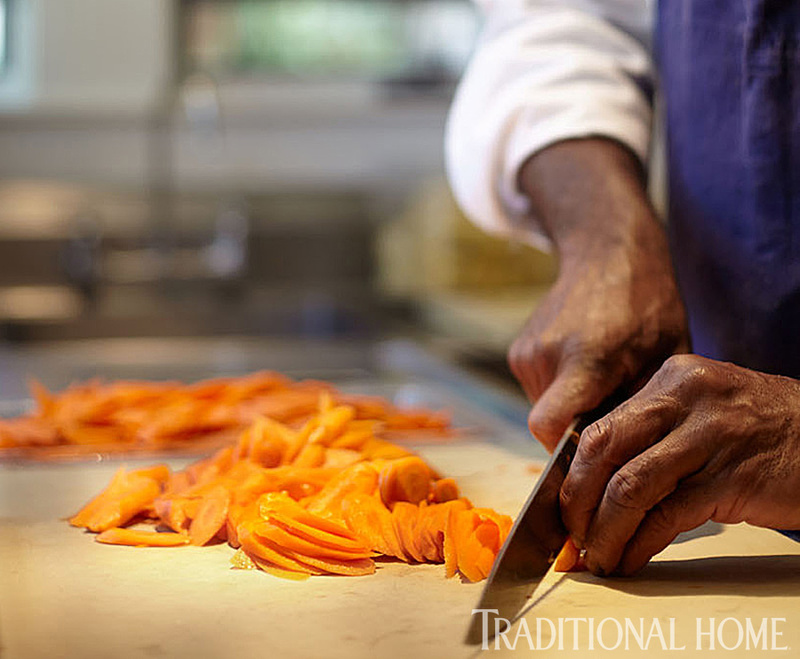 Classic recipes redefined for contemporary cooking continue to be the hallmark of The French Laundry. Heat an 8-quart rondeau or a regular 8-quart stock pot or Dutch oven over medium heat. Add the butter to melt, and then add the shallot and the sliced carrots. Cook until tender (about 15 minutes), stirring frequently. Add about a quarter of the carrot juice (1-1/2 cups) to the rondeau and gently reduce, stirring occasionally until the juice is almost syrupy (about 20 minutes), stirring occasionally. Add the cream and cook down by half (about 5 minutes), then add the remaining carrot juice and honey. Use an All-Clad immersion blender to blend the soup inside the rondeau or, alternatively, you can transfer the glazed carrots to a standing blender. Blend the soup until it is very smooth, then taste and add salt if desired. Strain the soup through a fine mesh sieve. This soup is equally delicious served cold or hot. Garnish with a few drops of olive oil. Makes 4 servings. If you own a juicer, and want to invest the time, you'll need about 4-1/2 pounds of carrots to yield 1-1/2 quarts of juice. Otherwise, use a carrot juice that has been juiced as freshly as possible (use 100% carrot juice). The best source for this is a grocery store such as Whole Foods, health foods store, or juice bar. Odwalla brand carrot juice is also a good substitute. 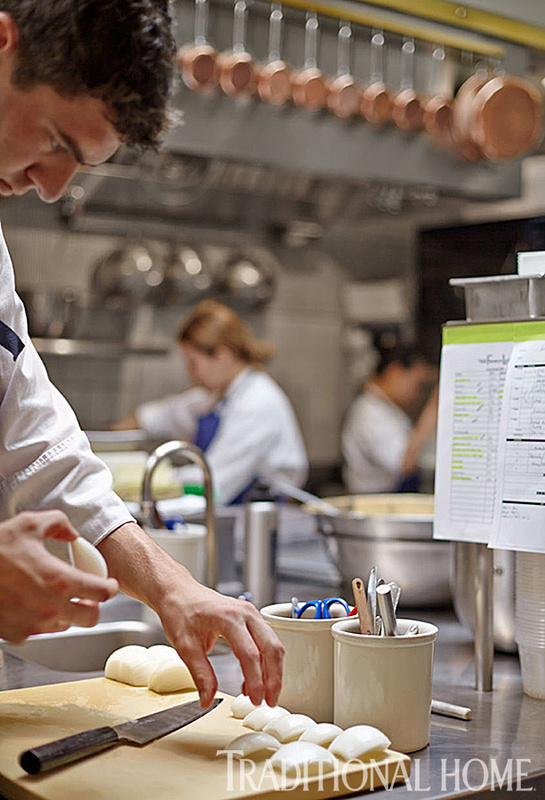 The French Laundry Cookbook, published in 1999, gives readers a glimpse into the kitchen at the renowned restaurant. The book’s recipes range from simple-to-accomplish in one kitchen session to others that are comprised of many separate components. None, however, are difficult to do and the book is full of useful tips to elevate everyday cooking as well as special occasion meals. Find the book here. 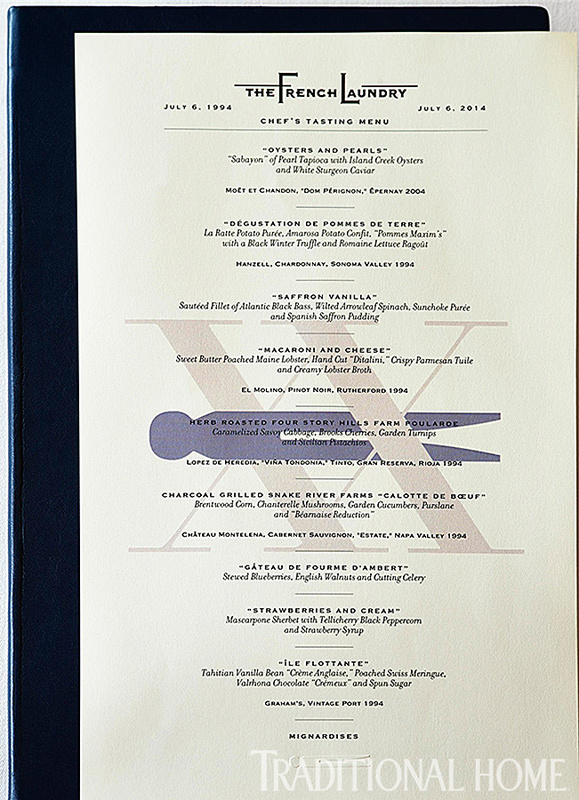 Book cover excerpted from The French Laundry Cookbook by Thomas Keller (Artisan Books) copyright © 1999. Photograph by Deborah Jones. Cookbook recipes on the following slides. Keller’s classic Île Flottante. 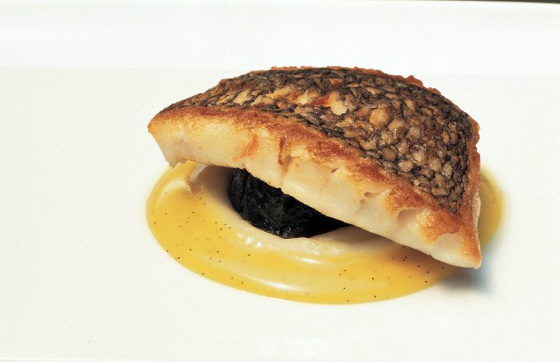 Photo and recipe excerpted from The French Laundry Cookbook by Thomas Kller (Artisan Books) copyright © 1999. Photograph by Deborah Jones. For the Meringues, preheat the oven to 250°F. Spray six 4-ounce soufflé molds or foil cups (about 3 inches wide) with nonstick spray. Combine the egg whites and sugar in a metal mixer bowl. Set the bowl over a saucepan of simmering water and whisk gently until the whites are warm and the sugar is completely dissolved. Remove the bowl from the heat and place it on the mixer stand. Use the whisk attachment to beat the whites until soft peaks form. Reserve 1/2 cup of the meringues for the mousse. Fill a pastry bag fitted with a large plain tip with the remaining meringue. Pipe the meringue into the centers of the 6 molds, allowing the filling to move outward from the center as you pipe to fill them. Smooth the tops of the meringues and place the molds in a deep baking pan. Pour in enough hot water to come halfway up the sides of the cups. If you are using foil cups and they float in the water, place a baking sheet or a pan over them to hold them down. Cover the baking dish with foil and bake for 20 minutes, or until the meringues are set but still moist. Remove the molds from the baking dish and refrigerate for 1 hour, or until firm. For the Chocolate Mousse, place the chocolate in a medium bowl. Bring 1/2 cup of the cream to a simmer and pour over the chocolate. Let sit for a minute, then stir until the chocolate has melted and the mixture is smooth. Let cool to room temperature. Beat the remaining 1/4 cup cream to soft peaks. Fold the reserved meringue, and then the whipped cream, into the chocolate mixture. To Fill the Meringues, leave the baked meringues in the cups, gently scoop out the center of each to make a rounded cavity, leaving a 1/2- to 3/4-inch wall of meringue. (A one-ounce ice-cream scoop works well for this.) Using a spoon or pastry bag, fill the cavities with the mousse; you will have some extra mousse. Return the meringues to the refrigerator to chill for at least 1 hour to set, or for up to a day. For the Chocolate "Salad," you will need about a tablespoon of shavings for each dessert. If you have a large block of chocolate, pull the blade of a large chef’s knife over the top of the block of chocolate toward you at a 45-degree angle to create shavings of chocolate. Adjust the angle of the blade as necessary. If you have a smaller piece, use a vegetable peeler to peel off the shavings. If the shavings are too brittle and the pieces are too small, let the chocolate warm up very slightly in a warm spot. Keep the shavings in a cool place. To complete, invert the meringues onto a paper towel and unmold them. (The towel will absorb any excess liquid.) Dip a 2 1/4-inch cutter in hot water, center it over a meringue, and cut down from the top to even the sides. Repeat with the remaining meringues. Spoon some Crème Anglaise onto each plate. 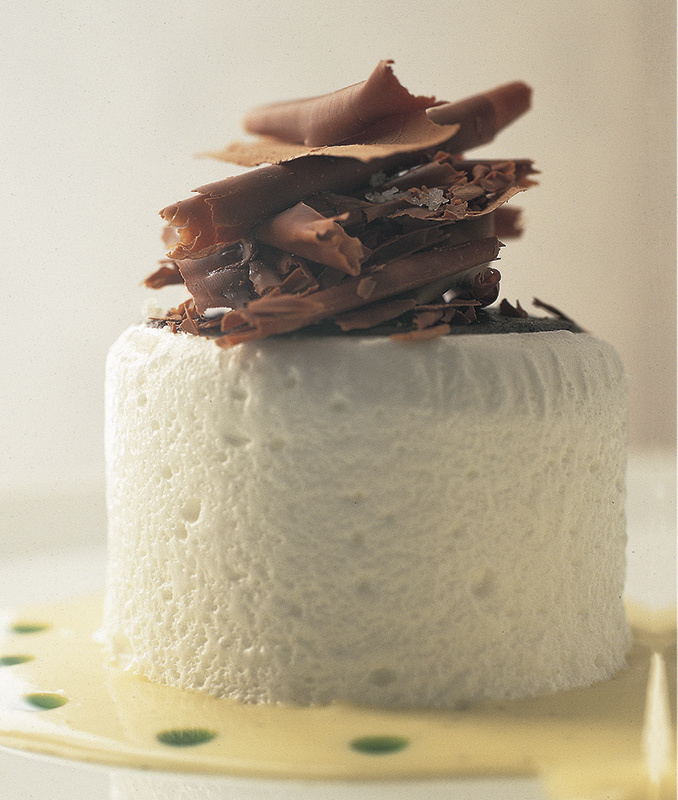 Place a meringue in the center of the sauce and lay a Chocolate Tuile over the top. Squeeze dots of the Mint Oil over the custard. Stack some chocolate shavings on each tuile, drizzle the chocolate "salad" with Mint Oil, and sprinkle with fleur de sel. Makes 6 servings. *Save the yolks from the eggs for Crème Anglaise. Note: The reserved meringue mixture used in the chocolate mousse does not cook long enough to reach a safe temperature. Our test kitchen suggests using pasteurized eggs or pasteurized liquid egg whites for the meringue. Scrape the seeds from the vanilla bean into a saucepan, add the pod, milk, and cream, and bring to a simmer. Turn off the heat and let cool to room temperature to infuse the flavors. Remove and discard the vanilla pod. Add half the sugar to the milk mixture and bring to a simmer, stirring to dissolve the sugar. Tip: Use the whites of the eggs for the Slow-Baked Meringues. 2. In a bowl, cream the butter and powdered sugar. Sift the flour and cocoa together. Beat half the cocoa mixture into the butter mixture, add the egg white, and then add the remaining cocoa mixture. 3. Cut a hollow round stencil with a 2 1/4-inch diameter. The top of a plastic container works well for this. 4. Place a Silpat® on the counter. Place the stencil in one corner of the Silpat® and holding it flat against the Silpat®, scoop some of the batter onto the back of an offset spatula and spread it in an even layer over the stencil. Run the spatula over the top to remove any excess batter. Repeat to fill the Silpat®. You will need only 6 tuiles for the recipe; extra batter can be frozen. 5. Place the filled Silpat® on a baking sheet and bake for 5 to 8 minutes, or until the tuiles are set. Let the tuiles cool to room temperature, then remove from the Silpat® using a small narrow spatula. Store the cookies in an airtight container until ready to assemble the dessert. Makes 2 dozen. 1. Remove leaves from mint. In a large pot of boiling water, blanch leaves for a second or two just until they turn a slightly darker shade of green. Drain and immediately plunge in a bowl of ice water. When cooled, drain and blot dry on paper towels. 2. In a small food processor or blender, combine mint leaves and canola oil. Cover and process or blend until finely chopped. Transfer to a small bowl. Cover and chill overnight to infuse color and flavor. 3. Strain oil through a fine sieve to remove mint leaves. 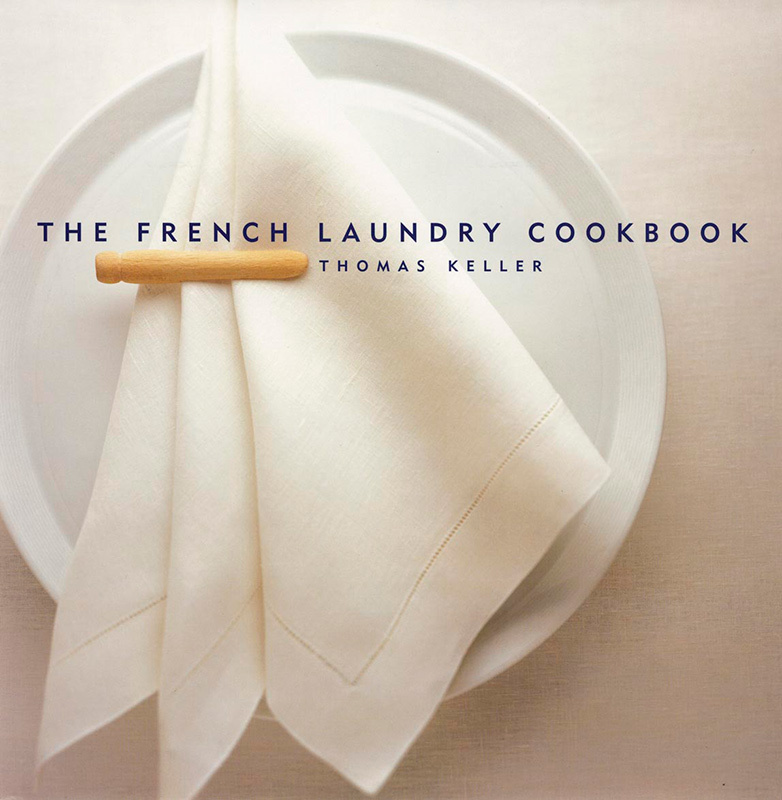 Excerpted from The French Laundry Cookbook by Thomas Keller (Artisan Books). Copyright © 1999. Photographs by Deborah Jones. For the Spinach, place the strips of orange zest in a large skillet with the olive oil. Heat the oil until it is hot and the zest begins to ripple from the heat. Add the spinach and sprinkle with salt (seasoning the spinach before it wilts ensures even seasoning). Cook the spinach until it wilts, then continue to cook for another 2 to 3 minutes to evaporate the moisture. Remove the spinach from the pan and separate it into 6 parts. Take each pile of spinach, place it in a clean tea towel, and twist the towel around the spinach to squeeze out any remaining liquid and form a compact ball. Remove from the towel. Refrigerate the spinach balls until ready to complete the dish. Place the cut parsnips in a saucepan with 1 cup of the heavy cream, the water, and salt. Bring to a boil, lower the heat, and simmer gently for 25 to 30 minutes, or until the parsnips are completely soft. Strain the parsnips, reserving the cream, and scrape the parsnips through a tamis* with a plastic scraper. Put the puree in a bowl and stir in enough of the strained cream to give them the texture of mashed potatoes. Transfer to a small saucepan and keep in a warm place. For the Saffron-Vanilla Sauce, scrape the seeds from the vanilla bean into a small saucepan and add the vanilla pod, mussel stock, and saffron threads. Bring the stock to a simmer, then simmer until reduced to a glaze (1 to 1 1/2 tablespoons). Add the cream and simmer for a few more seconds. Over medium heat, whisk in the butter bit by bit. It is critical to maintain the sauce at the correct temperature, as it can break if it becomes too hot or cold. Strain the sauce and mix for several seconds with an immersion blender to emulsify (if you don’t have an immersion blender, you can use a regular one, but rinse out the blender container with hot water before adding the sauce so it stays warm). Keep the sauce in a warm place. To complete, melt the 2 teaspoons butter in a small ovenproof skillet and roll the spinach balls around in it. Place the skillet in the oven to warm while you cook the fish. Heat 1/8-inch of oil in a large skillet over medium-high heat. Season the fish with salt and white pepper. When the oil is hot, add the fish fillets, skin side down. Press a lid or another pan down on the fish to flatten the fillets and keep the skin in direct contact with the skillet. Cook this way for a minute, or until the fish is “set.” Remove the lid and continue to cook for another 2 to 3 minutes, or until the fillets are almost cooked. Turn the fillets and “kiss” (briefly cook) the flesh side of the fish. Remove the fillets from the pan. While the fish cooks, reheat the parsnips over low heat and stir in remaining 1 tablespoon cream and the butter. Place a pool of sauce on each serving plate. Spoon some parsnip puree into the center and top the puree with a spinach ball. Set the fish fillets, skin side up, on the spinach and serve. Makes 6 servings. 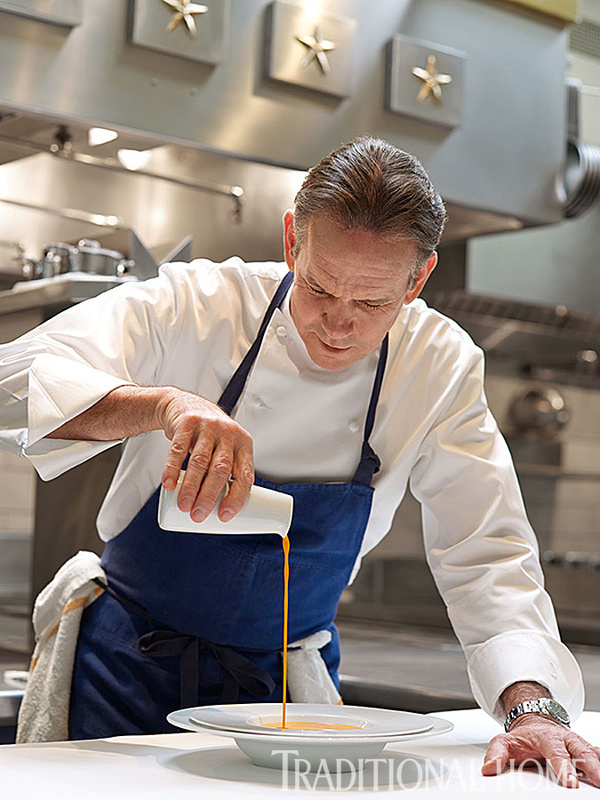 Chef Keller recently introduced his own line of cookware with All-Clad Metalcrafters, with whom he has collaborated for more than a decade. Keller designed the collection with existing All-Clad metal combinations for versatility and to ensure the success of multiple cooking techniques. 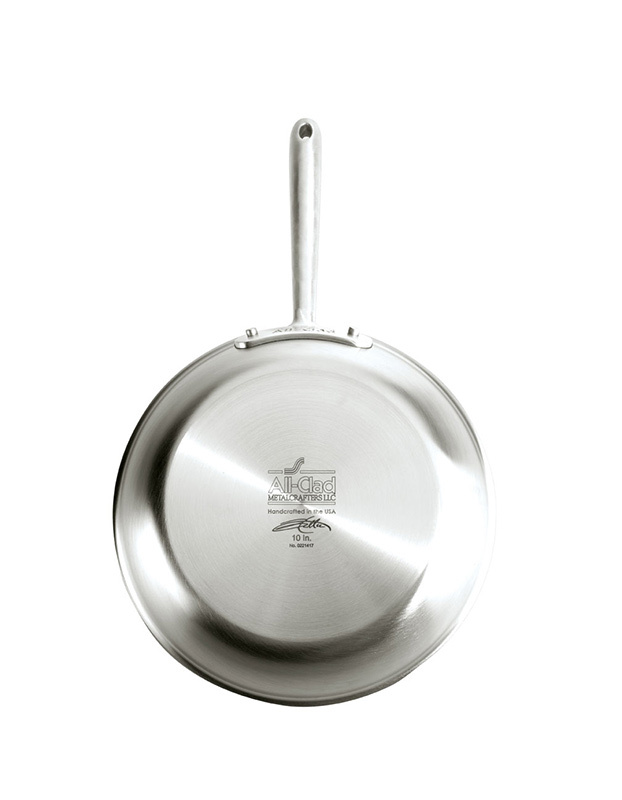 “We designed the pans for function and practicality,” Keller says. “The brushed stainless finish wears very well. I’m especially proud of the universal lid, which fits several pans.” The cookware features a rolled edge for drip-free pouring, and the pots and pans nest well for easy storage. Saucepans are wider than they are tall for better heat conductivity. Available at williams-sonoma.com.